The fashion seen at the Met Gala never disappoints, as it is one of the rare times our most respected designers, editors, and celebrities all come together for a beneficial cause.The gentleman's dress code request for the Met Gala held in New York City, on May 5th, 2014 was simple from Anna Wintour: white tie. Meaning white bow ties, tails, and an optional top hat. The theme was Charles James: Beyond Fashion, a dashing combination between James Bond and The Butler Next Door. While many of our handsome celebs chose to disobey the rules just a bit and go with their own fashion instincts, the integrity of their red carpet ensembles did not falter. 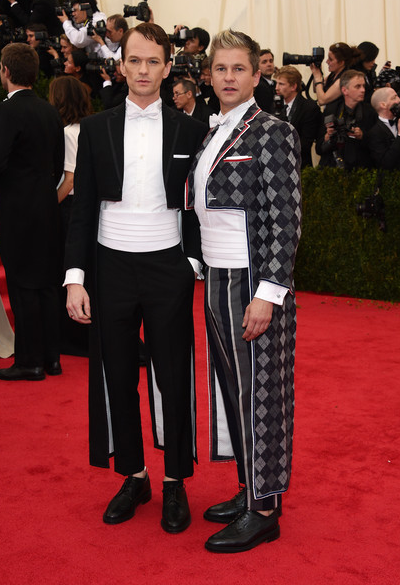 Neil Patrick Harris and partner David Burtka wore Thom Browne. While most of the celebrities sartorial numbers sang true to who they were, the ones chased by Neil Patrick Harris and his partner David surely shocked many on the red carpet. Possibly drawing inspiration from his new role, Harris boldly wore a cropped tux paired with cropped ankle length trousers. Now I must admit this was not something I would expect him to wear and at first I wasn't particularly fond of it. Over time and probably from staring at pictures so long it actually grew on me. I just personally feel with this style of tux things should be kept simple. Patterns just might over do it, but this couple handled this handsomely. It is a costume based event after all.